Infection in any type of facial implant is always a risk. Traditional method of prevention include Iv antibiotics during surgery, pocket and implant antibiotic irrigateons during surgery as well as oral antibiotics after surgery. This approach keeps the risk of infection in facial implants fairly low in the 1% to 2% range on average. But despite these standard prevention techniques infection can still occur. These begs the question of what more can be done from a prevention standpoint, particularly in higher risk patients such as larger sized implants. 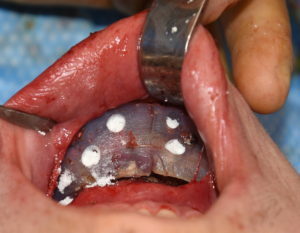 While the implant is soaked or washed in antibiotics during surgery, the reality is that this technique may have limited effectiveness. Most facial implants are not hydrophiic, meaning that the material does not absorb the antibiotics. Actually all such materials are exactly the opposite. They are hydrophobic meaning they repel the absorption of any fluid. One technique in select facial implant cases to add an antibiotic ‘load’ is to make holes in the implant using a 6mm dermal punch. These holes can then be loaded with antibiotic powder. These ‘antibiotic wells’ in the implant allow for release of the drug after surgery. The potency of this release would be dependent on the type of antibiotic powder used. Options could be Bacitracin, Gentamicin or Vancomycin powder, to name the most common. This simple technique of antibiotic impregnation into a facial implant bypasses the material’s natural hydrophobic property. In higher risk implant patients or with larger implants this is an additional option for infection prevention.